SAIC Motor is pressing the pedal on its India plans and is all set to launch its first product in the first half of 2019. We are in the Shanghai region right now where the Chinese maker has its headquarters. The company has taken a media contingent from India to China to let them witness their capabilities, scale and processes firsthand. We visited the company’s R&D centre where their impeccable design, development and testing capabilities were on full display. Later, during a press conference, key personnel from SAIC made some official announcements, while also answering the questions of the press. 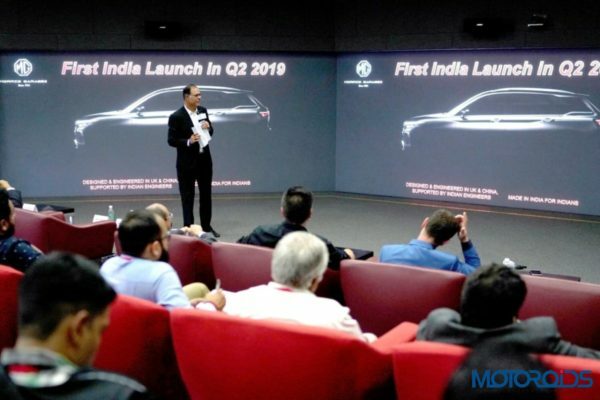 The company has some very ambitious goals for India, and it plans to launch it Salvo in the Indian subcontinent with the MG Motor brand, the British auto brand it acquired some time back. Here in this article, we’ll give you a very detailed overview of how the Chinese auto giant plans to play it in India. To begin with, SAIC – MG Motor has already bought the Halol Gujarat plant from GM in September of 2017. The company has completely remodelled it to suit its requirements. Alongside the production facility, SAIC is also developing a vendor base in the form of a global park comprising hi-quality vendors. In order to ensure that the process of manufacturing the components can be sped up, it’s getting trusted suppliers from China to set up operations as quickly as possible. The Halol plant has a current production capacity of 80,000 units but can be further expanded to 2,00,000 units per year by utilizing the existing free space. SAIC (Sha5ngai Automotive industry Corporation) is also getting its subsidiary Huayu to India for the manufacture of most of the required components. MG Motor plans to streamline the entire value chain and is engaging specialists to ensure quality and efficiency across all divisions. In terms of its dealership network, Saic – MG is taking the appointment of its dealers very seriously as their relentless focus lies on customer experience and satisfaction. The company will have 45 dealers and 100 touch points in the form of service stations etc ready when they launch next year in 2019. The company is very upbeat about their dealer selection and are claiming that they have handpicked the “best names” in the business of automobile dealerships to ensure quality sales and service. They have also conducted exhaustive background checks to ensure that some of the best names in the Indian auto dealership industry join hands with them. To ensure a superior customer experience, MG Motor plans on providing a 24-hour helpline and is targeting a response time of just 10 minutes when it launches. Other high points for the brand will be the quality and value for the products along with a low cost of ownership, industry best warranty, low cost of after-sales service and high resale value. The localization for petrol and diesel-powered vehicles in India will be high right from the outset. 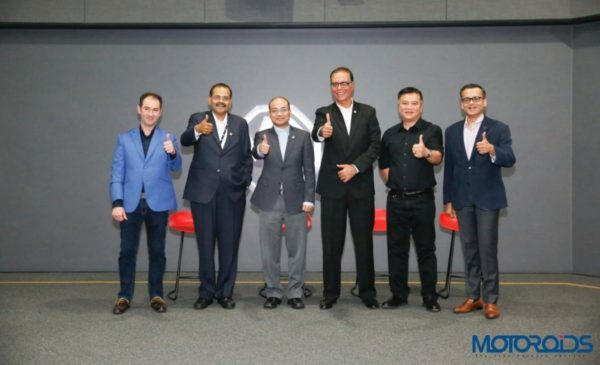 MG Motors will have localization content of up to 75% on their initial petrol and diesel-powered offerings, which will further increase with time. Localization content on the EV (Electric Vehicle) will not be as high to start with, and the company is not divulging any details on the same as of now. The company would have invested around 500 million dollars in India by the time the new SUV launches. Product assurance with a long lasting warranty, availability of spares, great service and a good resale value. MG Motor is backed by the might of SAIC (Shangai Automotive industry Corporation) which is the 36th biggest Fortune 500 company. It has SAIC, Roewe and MG as its passenger segment brands. Additionally, It also works in collaboration with VW (Volkswagen) and GM (General Motors) in China. The company’s passenger vehicle business falls under the SMPV (Shanghai Motor Passenger Vehicle division) umbrella, while the commercial arm is taken care of by the SMPV (Shanghai Motor Commercial Vehicle division). Many automotive manufacturers have already announced plans to roll out a fully electric vehicle in India by 2020. MG Motor, backed by SAIC’s specialization in EVs plans to seize this opportunity with the promised launch of its own EV in India. 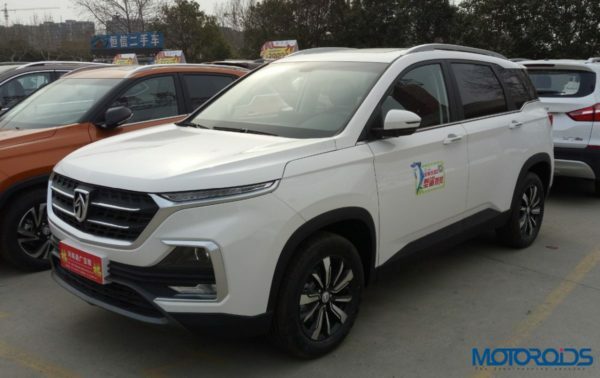 However, MG hasn’t revealed any additional details about their Electric SUV apart from the fact that it will be heavily localized which should help keep its overall costs at a minimum. That being said their first product in India is expected to be the Bujon 530 (As seen below). It is expected to get a 2.0-Liter Fiat sourced diesel motor that is also found doing duty in the Jeep Compass. Going forward, the company may also bring the SMCV (Shanghai Motor Commerical Vehicle division) to India. Currently, the focus is only the domestic Indian market but MG Motors may even export to the neighbouring countries of India like Bhutan and Nepal in the future along with plans to start exporting to the world if their business thrives in the domestic market. Overall, the speed at which SAIC-MG is rolling out its plan for India is very aggressive. Additionally their expertise in high-valued practical vehicles and frugal engineering they may very well spring a surprise on the Indian automotive industry. We wish them all the best for their endeavours in India, though this market, as many have seen is a tough nut to crack.